PPAP Star Features 'SUSHI' After Apple and Pineapple! 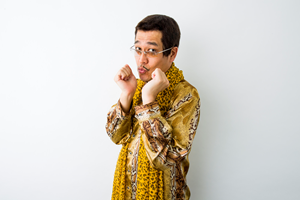 PAPP star, PIKOTARO, is releasing his latest sushi themed song, prior to the Tokyo Olympics in 2020! The title is "Can you see? I’m SUSHI"!! "Japan is THE Sushi country but there were not so many songs about sushi, so now I hope people all over the world and Japan will sing this song!" says PIKOTARO. In the music video, PIKOTARO charters a taxi for a day and visits wonderful sightseeing spots in Tokyo eating sushi. It’s the PIKOTARO style, cracking up, Tokyo travel guide video that anyone can enjoy even if they’ve never been to Tokyo. Also, the album “I have a PPAP,” with additional tracks released in 2017-2018 to the 1st album "PPAP" released in 2016, including “Can you see? I’m SUSHI” is digitally released worldwide on July 13th ! New music video "Can you see? I’m SUSHI"
Available on Spotify and Apple Music!